So after many months of hype finally it is here. And we are here with the Blackberry Z10 Review. It is a full touchscreen phone that has been made clearly with iPhone/S3/OneX in mind, thus it resembles the look and feel of a typical touch phone. This means the keyboard that every BB user loves is gone, this is not a phone in the typical BB mould BlackBerry has opted for a 1.5GHz dual-core processor and 2GB of RAM for the Z10's engine room. The dual-core chip might sound very mid-range since most top end smartphones have a quad-core processor plus there are 8-core chips on the horizon. There's no obvious support for Flash - as default it's turned off in the settings with no indication it's there at all. At 4.2in the screen on the BlackBerry Z10 is quite small when you compare it to the likes of the Samsung Galaxy 53 and the wave of 5in and larger handsets which will be coming out this year. The size hasn't bothered us so far; it's big enough to comfortably browse the web, use apps and watch video content. A quick comparison with its key competitors i.e. iPhone 5, S3 and HTC OneX. Processor: It is slower than the iPhone 5, S3 and OneX. In the age of Quad Cores, a dual core seems out of place but then again there aren't many apps available yet to fully utilize 4 cores. That being said, it does mean that if you purchase the Z10 it would be outdated quite soon! Memory: Again it is lower than the options given by 53 and iPhone 5. It is on par with the OneX but unlike both iPhone and OneX it offers expandable memory. RAM: In this area it is ahead of both iPhone $ and the One X which both have only 1GB of RAM. The Z10 and 53 both have 2GB which means faster speed when running multiple apps. Screen: A 4.2-inch screen may suite many people who aren't fond of the now giagantic 50 screens being offered by HTC and Samsung. This is purely a matter of choice, some prefer the larger screens, others dont. The quality of the screen is quite good, its ppi being better than both OneX and $3. Ports: We personally prefer the standard microUSB port found on all phones (except iPhones) and the Z10 has the same port which means compatibility with many existing accessories. This is definitely a plus. 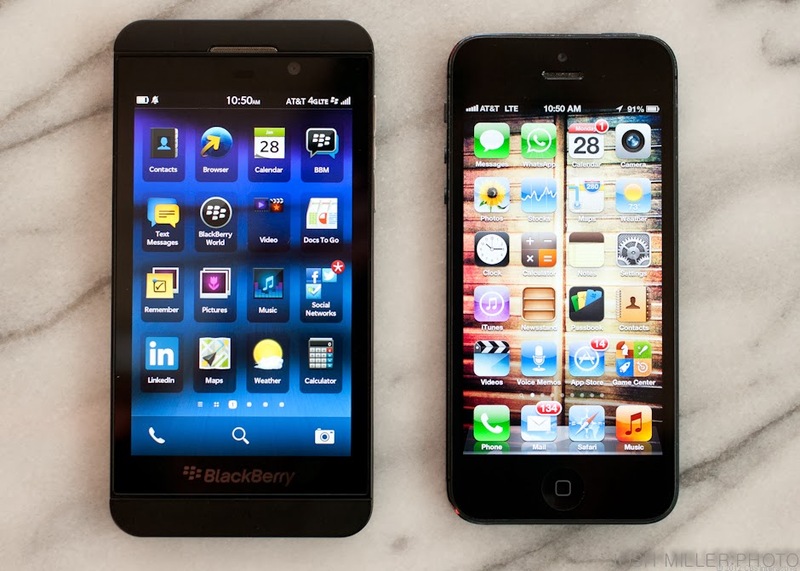 In a nutshell the Z10 is a decent phone but nothing impressive. It has a good feel to it, especially the metallic buttons. Web browsing is quite fast and the vast options of messaging are a definite plus. Add to this the ability to change the battery and add expandable memory, these are little wins for the Z10. However are is too much to dislike. 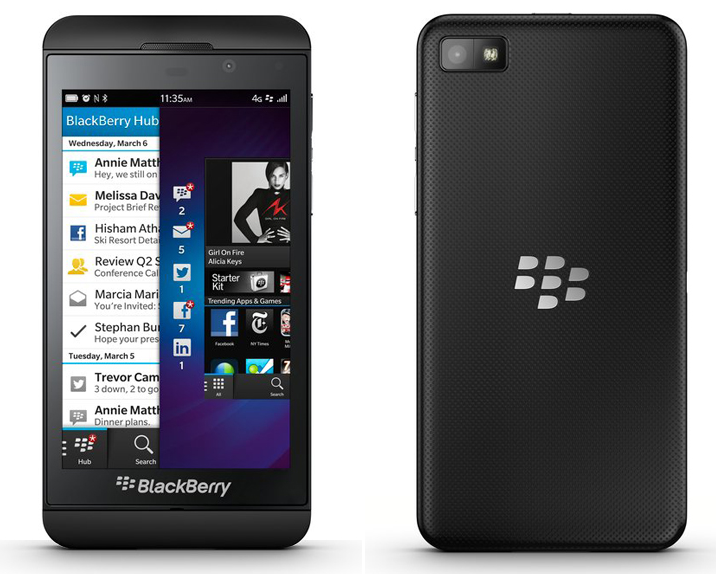 The BB 1005 is not the hit everyone was expecting. It is not user•friendly and will definetly confuse the average BB user during their initial use. We personally weren't very impressed with the hardware chosen by BB as it does not compete very well with the existing offerings by competitors. Overall, it is nothing special. And with a price that is almost equal to the 53, OneX+, Lumia 920 and Xperia Z, we cannot give you any compelling reasons to purchase the Z10 unless you are a die hard BB fan! The entire RIM group is depending on this phone, but we aren't sure whether it will live up to their expectations.